***Check out this Sears $175 gift card giveaway from Little Yaya's!!!!! Lia Sophia sent me one of their beautiful pieces of jewelry for review. 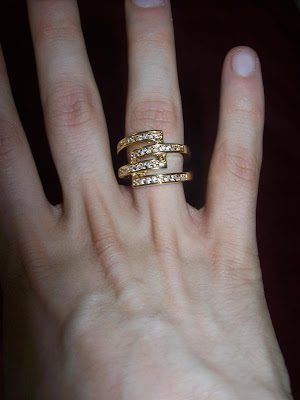 I chose the Golden Rule Ring which retails for $78 on their website. I am obsessed with this ring. It matches so well with my wedding band and engagement ring! I cannot stop staring at it too! The company also sells earrings, necklaces, and bracelets. Their jewelry is reasonably priced and looks like real gold, diamonds, silver, etc. I HIGHLY recommend it!! The giveaway will be for a pair of the Discotheque earrings that retail for $30 from Lia Sophia to one lucky reader! The giveaway is open until Midnight on Friday September 17th. Winner will be chosen on Saturday September 18th using Random.org. Go to the Lia Sophia website and let me know which piece of jewelry is your absolute favorite! newest follower from friendly wednesday! hope you get a chance to follow back! My favorite is the bolted bracelt. I entered your Frito Lay giveaway. I found your site because I subscribe to your blog! I think I found your site through another blog! I really like the Fashionista Necklace! Love the Azalea Pendant Slide. I love the Almondine Necklace. Like the Castaway bracelet--I'm into bracelets lately. My favorite item is the Epiphany Bracelet! I found your site initially through Giveaway scout and have been following you ever since! I love Lia Sophia!! Two women at my office sell it. I want the Acrobat Earrings in silver! I am now following on GFC. Thanks for the follow. I follow your blog and I love the Moon Dance Bracelet. I love the Day Dreamer Earrings. Thank you! I love the Instinct Earrings. I found this site a long time ago and subscribed to it. I dcan't remember now how I found your site, but I *think* it was through a linky somewhere. I entered the Creations by Shelly giveaway. I entered the SPIband giveaway. I entered the peanut butter giveaway. I found you via la bella vita. I like the Acrobat Earrings in gold. My favorite is the Bungalow Necklace. My favorite is the ARTISTIC FLAIR NECKLACE. I found you via TEN TALENTS Blog. I love the Chianti necklace! My fave one is Crossroads Ring. I subcribed ur blog through email. from Lia Sophia I like the Aristo Earring. Style 62668 The Impulse Ring is beautiful, thanks for sharing this site, will hopefully be doing some shopping there! I found you through Spectacular Savings. I have always been a fan of Lia Sophia jewelry. I hadn't seen the new catalog yet so it was great to browse the site. My favorite new piece is the Celestial Necklace. It is very elegant yet could be worn everyday. I entered the boardgame giveaway. The Appletini ring is so my style! I like the arcadia bracelet. I like alot of different pieces as well though. I am a follower of your blog.Love to have the earrings. The oz pendant slide looks awesome.